You want to create archived copies of your recorded TV shows: Although MCE PCs have big hard drives, eventually they fill up, and you need to erase some recorded TV shows to make room for new ones. If you want to keep some of those older shows, why not record them to DVD? Although Microsoft has not yet provided a way to make DVDs, there is a way to burn DVDs in Media Center: using Sonic PrimeTime software Roxio Consumer Products. PrimeTime is a DVD-burning application that plugs itself into your Media Center Start menu, so it’s easy to access and use with the remote control. You can even find PrimeTime in the Media Center Online Spotlight. Just open Online Spotlight and navigate to the Downloads section to download a free trial version. PrimeTime is designed to create DVDs of only your recorded TV content (from My TV). For an all-purpose DVD creation program, you can use Sonic’s MYDVD program. Many MCE PC vendors include a version of MyDVD with their MCE PCs. 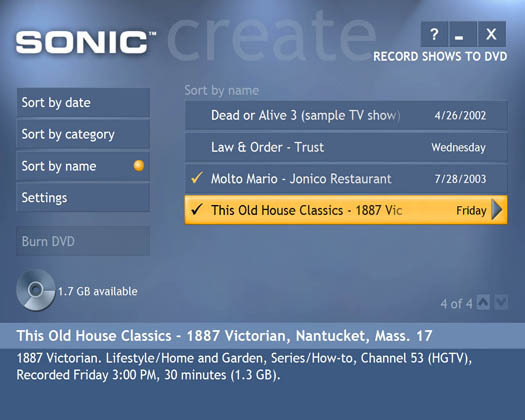 PrimeTime automatically searches your MCE PC for recorded TV shows and organizes them by name, date recorded, or category — just like My TV does. Using the remote control, you can select the shows you want to burn to DVD and then record them with a single press of a button. PrimeTime even records video CDs, which are similar to DVDs but are on recordable CDs instead of DVD media. Video CDs hold a lot less video, but can be played back on most DVD players and are an option if your MCE PC doesn’t have a DVD recorder. Figure 1 shows the PrimeTime interface in MCE. To get to this interface, select Create DVD in the Media Center Start menu. Figure 1: PrimeTime in action. You can use DVDs created with PrimeTime in just about any DVD player. PrimeTime is also one of the only programs that can convert the files that Media Center uses to record TV (called DVR-MS) to standard MPEG files that a DVD player can display. This is a BIG DEAL! You can insert a rewritable DVD (marked RW) into your MCE PC and use PrimeTime to change its contents. You can remove all the programs you recorded and replace them with others, you can remove a few, or you can add more shows if you have room. PrimeTime uses Dolby Digital (AC-3 encoding) to record the audio portion of the DVD. Dolby Digital is a compressed audio system that uses about one-tenth the disc space of the uncompressed alternative, PCM. So with PrimeTime (and Dolby Digital), you use up less of the DVD’s storage space with audio — leaving room for more TV shows per disc! Media Center does not support Dolby Digital 5.1 for My TV, so you get only two-channel (stereo) sound from any recorded TV programs. PrimeTime has a handy “bit-budget” indicator. (See the disc on the left side of Figure 1.) As soon as you select a show, the indicator updates the amount of space left on the DVD. PrimeTime works with all types of recordable DVDs (the blank discs themselves) and makes DVDs that can play in the vast majority of DVD players. You can be pretty darned confident that grandma will be able to play that disc you sent of the grandkids’ latest school recital.